The South Dakota Community Foundation selected South Dakota Historical Society Foundation to receive a $15,000 grant for its Pioneer Girl: The Annotated Edition Book project. 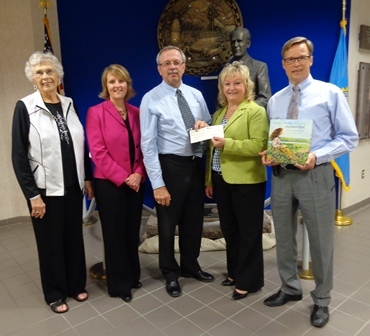 This grant was presented through the South Dakota Community Foundation’s South Dakota Fund Grant program. The South Dakota State Historical Society Press has successfully negotiated the worldwide, exclusive rights to publish Laura Ingalls Wilder's Pioneer Girl. Pioneer Girl: The Annotated Edition will make Laura Ingalls Wilder’s unpublished autobiographical manuscript available to the public for the first time. This handwritten autobiography formed the foundation of the Little House series for which Wilder has become so well loved. Pamela Smith Hill, the award-winning author of Laura Ingalls Wilder: A Writer’s Life, will annotate Wilder’s original text, providing historical context and commentary, plus two essays setting the work within the paradigm of Wilder’s children’s stories. Pioneer Girl: The Annotated Edition will bring to light Wilder’s last remaining unpublished work.